After Zim Integrated Shipping Service ship Zim Piraeus was kept offshore due to a pro-Gaza protest at the Port of Oakland on Saturday, August 16, 2014, a longshore shift from ILWU refused to cross "community pickets" on Sunday, August 17, leaving the ship docked but unloaded. If another shift of longshore workers honor another community picket this morning, it will effectively continue the action to prevent the ship from being unloaded in Oakland. Sunday night, August 17th -- I just got back from a picket line at the Port of Oakland. So the Zionist ship that had been cruising around in circles for the last day or two finally snuck into port this afternoon, apparently thinking we'd be gone. But we were there. Yes, we were there! And the dockworkers refused to cross our picket lines. The word on that came at 8:12 p.m., that the workers had decided to go home. That was just as night was falling. We picketed at four gates of SSA, which is where the OPD attacked protesters back in 2003. I was at the very last gate. I counted about 45 of us there. Hard to say about the other gates, as we drove by it I got a quick look, and I'd estimate that there were maybe 200 of us in all. While walking the picket line we chanted, “From the River to the Sea, Palestine will be free” and other chants. I told someone it was my birthday, the others heard me say that, and then they sang the Happy Birthday song for me. I'm 73 today. And about a half hour later it became a truly, truly happy birthday, when the announcement came through that the longshoremen would not unload the ship tonight. But we're not done with that Zionist ship. Please gather at the West Oakland BART station tomorrow (Monday) morning at 5 a.m. We'll picket again! Free Free Palestine! and a loud hearty cheer for the dockworkers of Local 10 of the ILWU!!! Members of the International Longshore and Warehouse Union were unable to report to work Sunday night at SSA Marine’s terminal in Oakland, Calif., due to volatility associated with a large demonstration and significant police presence at the gates of the facility. In 2005 [it was actually 2003 -- EL], Oakland police fired rubber bullets in similar circumstances, wounding several longshoremen who were trying to report to work. The demonstration at the Oakland International Container Terminal was in protest of Israel’s occupation of the Gaza Strip and was directed at the calling of a Zim Integrated Shipping Services vessel associated with the State of Israel. The ILWU has taken no position on the issue associated with the demonstration, but in cases when unsafe circumstances arise at the point of entry, the union must protect the safety of its members in the workplace. When it was ascertained that last night’s demonstration and associated police presence created an unsafe environment, dispatched ILWU-represented Longshoremen and Clerks that arrived at the SSA gate to work stood by instead at a safe location away from the demonstration point. SSA, after recognizing the safety situation associated with ingress to their gates, released all ILWU manpower at 7:30 p.m. It's an interesting development, because without a contract -- and hence the arbitrator chosen my both the union and management -- the workers have more leeway in choosing whether to cross the "community picket" or not. NEWS UPDATE (Monday, August 18, 2014, 12 noon) : unconfirmed reports are saying that longshore shifts dispatched to work the ship have been sent home by SSA today as well, making it the 2nd day of the effective boycott of the ship, Zim Piraeus, owned by an Israeli firm. 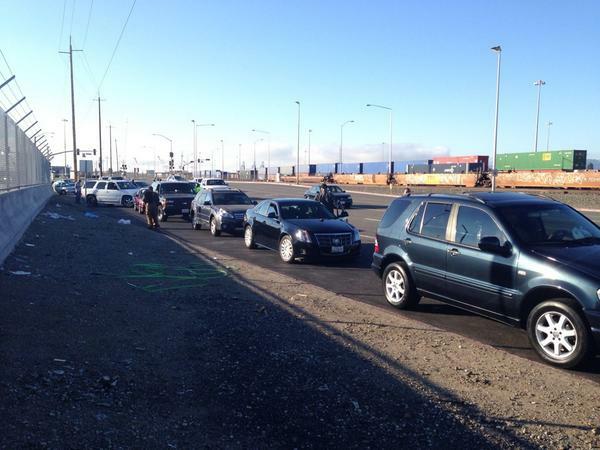 I applaud the actions of the longshoremen in refusing to cross the protest "picket". However, I don't really understand why the person who wrote the account keeps referring to it as a "Zionist ship"? The rhetoric often devolves into hyperbole that gets so convoluted that it crosses the line into being disingenuous. • "Zim offloads at the Oakland port every Saturday, carrying goods that are made on confiscated Palestinian land — both in settlements in the occupied West Bank, including East Jerusalem, and within present-day Israel." Again, simply untrue. These Zim ships making calls on the U.S. West Coast, either operated themselves or in carrier alliances with partners like Taiwan-based Evergreen, are shuttling intermodal cargo containers between China and the U.S., or go from Canada, Jamaica, Central America, the U.S., Russia, South Korea, and China -- and back in a circuit -- and have nothing to do with goods from Israel, Palestine or anywhere else in the Middle East. Hard to call this a victory, even by default, but the effect is still the same. they sang the Happy Birthday song for me. I'm 73 today. So, I didn't know the ILWU was without a contract at the moment. I'd be curious to hear more about that if you've got details? I'm also curious to hear folks thoughts on where these sorts of actions fall in the activism ---- class struggle spectrum? I mean, even as activism, I think practical stuff like this is better than a protest outside the Israeli embassy, for example. On the other hand, what does it mean that the union has to publicly proclaim it's not taking a side and this is just a matter of "health and safety"? Maybe, on the ground, longshoremen are involved and this is a bit of wink-and-nod happening. Anyway, I get not all this can be disclosed on a public forum, but I'd be curious to hear a bit more about the relationship between the community activists and the port workers. Maybe, on the ground, longshoremen are involved and this is a bit of wink-and-nod happening. Anyway, I get not all this can be disclosed on a public forum, but I'd be curious to hear a bit more about the relationship between the community activists and the port workers. During the whole series of actions at the Port of Oakland during Occupy, there were never more than 2 or 3 active rank-and-file members of ILWU involved. At these recent pro-Palestine events, there was never more than 1 active union member involved (along with a couple of retired ILWU members). Many of the activismists involved in actions like these have politics that might be described as anarcho-Leninist-subsitutionism, which sees class struggle as coming from outside. This ideology dismisses working class agency (meaning the self activity of the class), especially rank-and-file strikes, as impossible or improbable. Hence they only find success in actions like blockades, not worker-led stoppages. Despite it's obvious militant tradition, this is reinforced by ILWU bureaucrats unwillingness to fight back to defend gains won in actions like the 1934 San Francisco General Strike, then the 1,399 strikes -- both legal and illegal -- to defend those gains from 1934 until 1948. See Robert Brenner and Suzi Weissman's "When Unions Used to Strike" for a decent account of this history. The Zim ship remains docked at the Port of Oakland, but no longshore workers were dispatched to it this morning. A picket had been set up, but with no workers arriving, it was pulled down when that became clear. Hello, can I confirm the relationship with Israel here? Is it cos Zim is an Israeli company? Noone has established it here. I don't know about this particular situation, but I think there's a real tendency to just frantically denounce anything and everything as ZIONIZT!!!11! and then charge blindly at it. Look at folks unloading potatoes in supermarkets etc and then patting themselves on the back. Part of me wonders whether this isn't basically an expression of the frustration the international 'activist' scene feels at its utter futility to impose its positivist WE CAN CHANGE IT attitude - which is not always the best attitude anyway - on the Israel-Palestine conflict. This will be unpopular, and I suppose I'll get loads of down votes by anonymous tools, but I'm kinda coming round to the belief that the best thing Palestine solidarity activists can do is either engage in aid/relief (the Medical Aid for Palestine charity seems legit, right?) or just give up and accept that the situation out there is way too wrought and fucked up for their casual hobbyism to make any positive impact. Despite claims of a "major victory," the Zim Piraeus feigned an exodus this afternoon, then did a u-turn under the Golden Gate Bridge and returned to the Ports America Terminal in the Outer Harbor. Without the assorted picketers, the 30 or so who could make it there in time, posing a "health and safety" concern (as judged by the union itself), the longshore shift proceeded past them and went to work unloading the ship. Since Israelis are only minority shareholders in the Zim Line, following the activismist logic it's only it a 32% victory for Gaza -- since that's how much Israelis own and it was only a 3-day delay. This has been a summer of congestion for carriers, so a 3-day delay is simply part of doing business. The Port of Rotterdam is so busy now that ships -- and goods -- are being diverted to Antwerp. The Port of Vancouver in Canada has been turning away ships that have any goods destined for the U.S. Since all shippers are facing near-universal delays in moving goods across supply chains and through nodes across the globe, it's hard to see how this delay in Oakland is anything other than a slight inconvenience. Since the cost to not only Israeli firms, but also to the Israeli state, is negligible, it calls to question the point of these meaningless pageants, since even at the symbolic level they're nothing more than pandering to the bourgeois media. This has been a summer of congestion for carriers, so a 3-day delay is simply part of doing business. The Port of Rotterdam is so busy now that ships -- and goods -- are being diverted to Antwerp. The Port of Vancouver in Canada has been turning away ships that have any goods destined for the U.S. Since all shippers are facing near-universal delays in moving goods across supply chains and through nodes across the globe, it's hard to see how this delay in Oakland is anything other than a slight inconvenience. Yes, most likely. I saw in one logistics journal that the protest was described as a "minor inconvenience". But can you enlighten me as to why there is such a delay everywhere? Is it a port capacity issue or labour shortage? Or congestion beyond the ports? From what I read there is labour shortage on the West Coast, but is that the cause? We interviewed a recently retired railroad worker last weekend. His assessment, which we agree with, is that in addition to this summer's bumper crops of soy, corn and wheat, the shipments of Bakken shale across North America have taken off exponentially, massively congesting railroads in the U.S. and Canada. And these shipments are, in many cases, being given priority on rail routes. From talking to truckers, the crisis is due to chassis (the trailers that are attached to and used to haul intermodal cargo containers) shortages, exacerbated by carriers (in this case, steamship lines) no longer owning them and dumping them onto ownership "pools" in each port. And often chassis pile up in one logistics node, without being "backhauled' to the ports. Longshore workers, conversely, blame the carriers for relying more and more on super-post-Panamax ships, like the "Triple-E" ones run by Maersk. These mega ships can carry as many as 18,000 twenty-foot-equivalents (TEUs, the measurement standard for containers). The maximum size for the present Panama Canal is 4,500 TEUs, with the typical West Coast ship size being between 8,000 to 12,000 TEUs. This has created a situation where a single ship offloads an amount equivalent to what used to be carried by several over a period of weeks. Hence ports simply can't handle so many containers at once, leading to consolidation of many terminals into fewer, larger ones (the Port of Oakland went from 11 a decade ago to 5 today). As for the West Coast labor shortage, with truckers it's because many of them are leaving the industry because of the miserably low pay. They are forced to endure hours-long waits in port terminals, but work piece-rate and at times don't even earn enough to cover their own expenses (since being classified with the legal fiction of "independent contractor," all the maintenance, fuel and insurance costs have been externalized onto them). For longshore, the Los Angeles/Long Beach port complex is a perfect example because there are currently 14,000 fully unionized dockers as well as 14,000 casualized ones. Management at the ports refuses to allow more of the casuals to be brought into the permanent unionized labor force, obviously because of the high pay and "Cadillac" health benefits. They simply don't want to pay for a sufficient number of longshore workers. The congestion in Europe is for different reasons, including spikes in traffic and labor shortages. But in some cases is also ports reaching their capacity and not having proper contingency plans for overflow. Thanks for enlightening me! Very interesting, and I do remember reading something about the chassis shortages. Had no idea about shale shipments taking up so much capacity on railways. I wrote a parody of Jew-baiting after the indymedia report, and called them out on the "Jewnited States" flag. The moderators didn't publish my comment, but they did disappear the offending photo. Now the blatant antisemtism of the banner has been hidden. The hypocrisy is grotesque.